YouGov CEO Stephan Shakespeare, considers the summer drinks market. The summer of sunshine to which the British public has been treated presented a wonderful marketing opportunity to brands - especially alcoholic beverage companies - to cash in on consumer desire to make the most of their ‘fun in the sun’. Pimm’s are a brand apparently synonymous with summer, representing a traditional image of sophisticated alcohol consumption at parties and barbeques country wide. But how do other brands that position themselves as ‘summer drinks’ compete against the dominant position Pimm’s hold? Pimm’s benefits from being associated with many high profile sporting and cultural events throughout the British summer. Wimbledon and Royal Ascot are two prominent events to which the drink is linked. In fact, Pimm’s isn’t officially partnered to the events, but benefits from the stereotype and tradition associated with them. The social aspect of world cup viewing has also contributed to projected higher sales during the past summer months. Many cider brands have tried to position themselves as an alternative summer drink. Particularly conspicuous in the market are Bulmers. We would of course, expect a certain pick-up in our metrics during the summer months. Our Ad Awareness metric reveals if a respondent has seen any adverts produced by a brand in the two previous weeks. 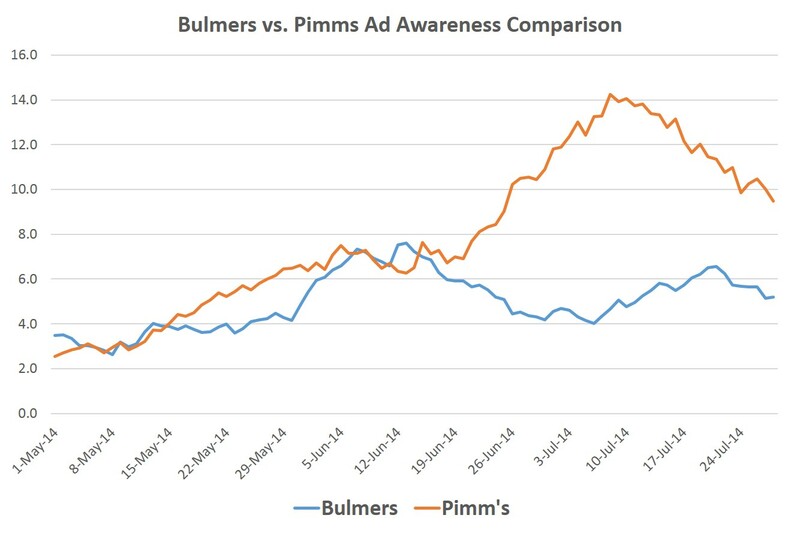 If we analyse our data, we see that until the mid-point of May, Pimm’s and Bulmers were relatively well matched. Since then however, we have seen a steep improvement from Pimm’s, while this contrasts with initial improvement from Bulmers, followed by a tailing off. Since the beginning of May, Pimm’s has an average score of 7.9 while Bulmers is behind on 5.0. 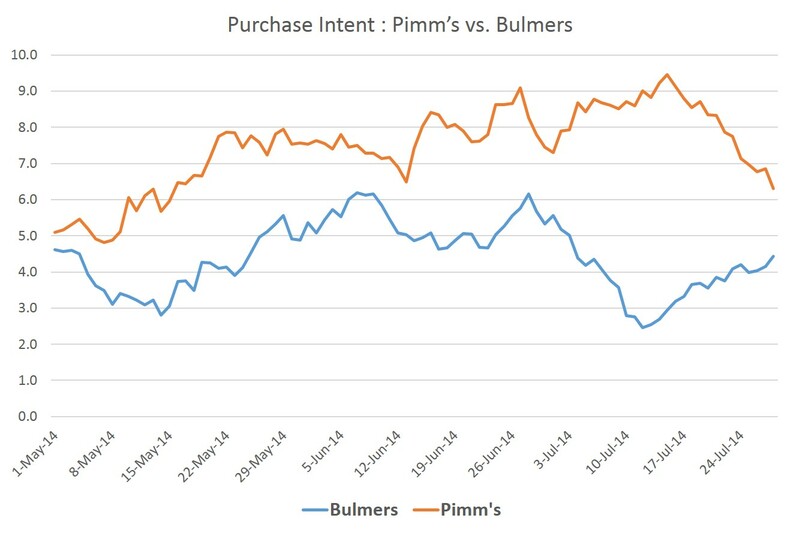 Indeed, Pimm’s has reached a high point of 14.1 against 7.6 of Bulmers over the period, highlighting the gulf between the two. Our Purchase Intent metric can indicate how likely respondents are to buy a product. If we consider the measure for the two brands since the beginning of May, we find the Ad Awareness figures reflected again in this metric. From the start of May, we see an increase from both the brands, with the improvement most pronounced for Pimm’s. Bulmers has an average score of 4.4 over that period of time, contrasting with 7.4 for Pimm’s. Both brands may be slightly perturbed by decreases in their scores during this period however, at a time they would expect consistent purchase intent scores. Pimm’s peaked during this period at 9.5, with Bulmer’s highest score 6.2. With the summer shortly drawing to close, both brands will be hoping they capitalise on their current increased presence in order to boost sales before the dark nights draw in.